Hardcover, 160 pages, 171 ills. At the invitation of the Toulouse art festival “Printemps de Septembre”, the Cuban-American artist Jorge Pardo (*1963) has developed a new display for the collection of Romanesque art at the Musée des Augustins in Toulouse. This collection—the world’s largest collection of Romanesque sculpture—is unique for its coherence with its well-preserved ensembles of capitals. Pardo produced a kind of “Gesamtkunstwerk” that has instantly become an iconic feature in the city and has now been adopted as the permanent display. This book includes an introduction to the collection of Romanesque sculptures at the museum, an illustrated history of its ever-changing presentation since 1830, an extensive survey of Jorge Pardo’s specific works for museums as well as a brief history of remarkable exhibition designs for museum collections throughout the 20th century. With an interview between Stephen Prina and Jorge Pardo. In 1888, Vincent van Gogh, ravaged by heavy drinking and disillusioned with life in Paris, found refuge in Arles, intent on creating an artists’ commune. ‘L’Atelier du Sud’ would, he hoped, become a laboratory to experiment with colours and light, repositioning the Provençal city as a centre for artistic production. But the project ended abruptly the same year, after a series of violent quarrels with his friend Paul Gauguin – the only artist who had responded to the invitation – drove the Dutchman to a mental breakdown, during which he famously cut off part of his own ear. Despite its failure, the ideals behind l’Atelier du Sud left an indelible mark on Arles which, some 130 years later, may get its artist colony after all. Designed by the Cuban-born American artist Jorge Pardo, l’Arlatan – a hotel and artist residence, housed in a 15th-century palace once belonging to the Counts of Arlatan de Beaumont – is set to become a hub for the international intelligentsia brought to the city by the newly established contemporary art centre, Luma Arles. Reinstallation of LACMA Latin American Galleries, Los Angeles, USA. Courtesy 2008 Museum Associates/LACMA. Jorge Pardo is the kind of artist whose practice is hard to neatly fold into a single sentence, unless it’s a run-on. He has reinvigorated, and fully furnished, a 19th-century hacienda in the northern Yucatan jungle, “Tecoh”; added Minimalist yet vivid decor into a liturgical parish in Leipzig; suffused undulating forms into the Latin American Galleries of LACMA; sprinkled bubblegum-bright tiles throughout the ground floor of New York’s Dia building; created towering public sculptures in Liverpool whose stalks were punctuated by illuminated Plexiglas spheres. His impactful early work was a single-story residential structure at 4166 Sea View Lane made for the Museum of Contemporary Art in LA, which he later moved into. Born in Cuba and raised in the US, Pardo’s home base for the past 10 years has been Merida, Mexico. This locus has influenced Pardo precisely because “there’s not a lot of art here,” he said. 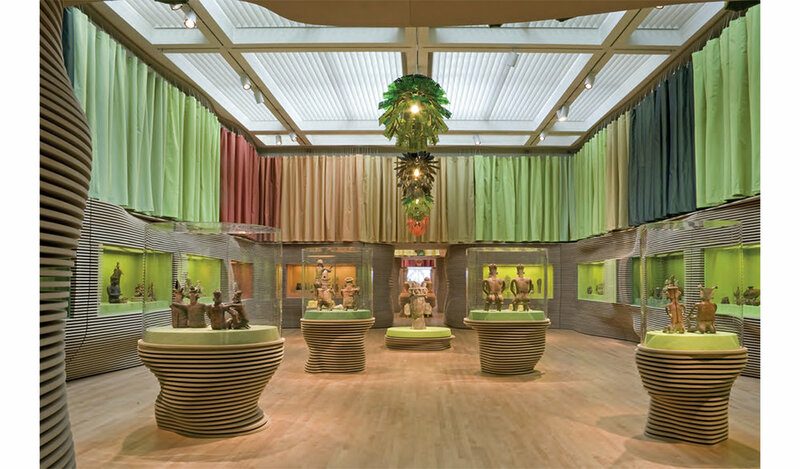 The polychromatic work he produces can evolve without distractions in the immersive tropical context (barring his regular jaunts to New York City to see his daughter). His relationship to pattern — the optics he fashions using a vibrant palette — is based on perpetual experimentation. Rearranging and rearranging paint chips in a way that imbues an inherent playfulness, “I’m always looking at color relationships,” he said. On the phone from his studio, the affable Pardo refuses to intellectualize his work, recognizing instead the meandering curiosity that motivates his creativity. He studied at Art Center College of Design in California (Mike Kelley was one of his advisers) but, he countered, “I read so much theory when I was a kid, it was ridiculous,” adding: “we were forcefed.” Instead: “I tend to privilege what I was thinking, not necessarily what I was trying to achieve,” he said. “I don’t like the artist being an ‘authority.’” Although his aesthetics evoke something beautiful and whole, cohesion is not his priority. “I wanted to make an object that would resist a certain critical formalization,” he once told author Lane Relyea during an interview. “I wanted to make a work that would impose a lot of different critical modes.” He reiterated: “I’m not particularly interested in formal questions — I don’t know how to believe in that.” As an artist, “your only contract with the viewer is to literally just show them something,” he said. The artist Jorge Pardo makes work that not only lives outside the confines of the traditional white cube but also interrogates notions of space and setting and our place within them. One of his best-known pieces dates to 1998, when, for a show with the Museum of Contemporary Art, Los Angeles, he designed a single-story house in the city’s Cypress Park neighborhood and filled it with objects of his own making. Once the exhibition closed, Pardo moved in. “I’m essentially appropriating architecture,” says Pardo, who now lives in Mérida, Mexico, in another structure that could be considered both art piece and functional living space — a “birdcage in the jungle” complete with a hand-painted mural and ovoid pendant lights. Installation view of ‘Jorge Pardo’ at Victoria Miro. Floating through the upper level of Victoria Miro gallery like a shoal of serene deep sea creatures are the latest works by renowned Mexico-based Cuban-American sculptor, Jorge Pardo. ‘I don’t do chandeliers very often, and I wanted to see what came of making some,’ states Pardo, surveying the colourful laser-cut plastic lamps that are set at different levels around the space. Pardo, who is showing for the first time with the London gallery, has a refreshing matter-of-fact approach to his work. ‘Shows generally do not really have a conceptual organising principle,’ he explains. ‘Sometimes they do, but most of the time they really don’t. I don’t like anecdotes – artists are not that smart,’ he adds with a laugh. Comprising paintings and large-scale chandeliers, the exhibition will draw viewers into an environment of form, colour, illumination and shadow. The exhibition Jump into the Future – Art from the 90's and 2000's. The Borgmann Donation shows an extensive number of contemporary art works from the German collector Thomas Borgmann. Jump into the Future - Art from the 90's and 2000's. The Borgmann Donation is a major exhibition that occupies no less than 2.540 m2 - all thirty of the first-floor galleries that surround the museum’s grand staircase. The group of works that will join the collection of the Stedelijk is made up of a donation, a purchase and long-term loan. The gift is the second largest in the history of the Stedelijk. 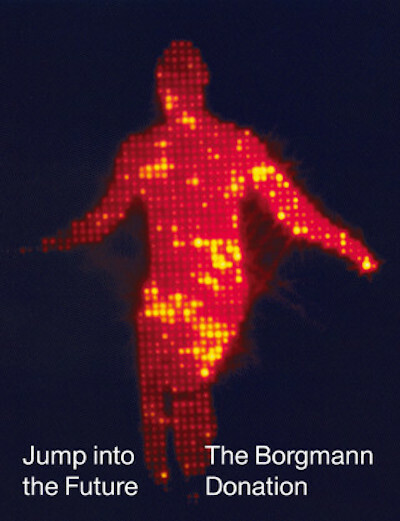 The majority of The Borgmann Donation is included in Jump into the Future. Jorge Pardo poses in front of a new art piece, which he invites children to add to, at the Lux Art Institute in Encinitas. On view through Aug. 5. When Jorge Pardo was invited to spend time as an artist in residence at the Lux Art Institute in Encinitas, he had a set goal in mind: to create an original, new art piece in just five days. The Mexico-based artist spent June 12 through June 17 staying at the Lux to work on the large canvas-based piece. Other artists have in the past chosen to spend up to a month there. "I gave myself a week to make something that would be interesting, and that's really the only agenda here," he said in an interview on the day he he arrived at the studio. "The interesting thing is to use the space and to make something here. They're very flexible about how and what artists do. Residency can be a lot of things: it can be a retreat for people or it can be work." During his time at Lux, he created a 5-foot-by-30-foot scroll work that is covered with silkscreen ink in bright colors such as pinks, purples and oranges. He had planned the work for months, with materials sent over ahead of time, to make the most out of his stay at the Lux, he said. Uta Barth, "…and to draw a bright white line with light (Untitled 11.5)," 2011. Since LACMA's establishment, living artists have played an instrumental role in understanding the museum's encyclopedic collection through a contemporary lens. L.A. Exuberance: New Gifts by Artists features a selection of works given to the museum for its 50th anniversary, as part of an unprecedented campaign led by artist Catherine Opie. Featuring over sixty gifts, the exhibition includes additions to the collection by Edgar Arceneaux, John Baldessari, Uta Barth, Larry Bell, Tacita Dean, Sam Durant, Shannon Ebner, Charles Gaines, Ken Gonzales-Day, Glenn Kaino, Friedrich Kunath, Sterling Ruby, Analia Saban, James Welling, Mario Ybarra Jr., and Brenna Youngblood. These stellar works of art have been assembled by the Santa Barbara Museum of Art curators for a special auction in conjunction with the Museum's 75th anniversary gala on September 18th. Auction proceeds will support a wide range of programming and ensure the success of the SBMA into the future. The auction is live on Paddle8 through September 19, 2016.